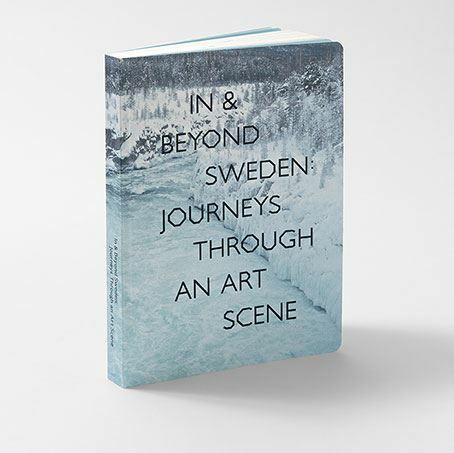 The freestanding publication IN & BEYOND SWEDEN: Journeys Through an Art Scene is published in conjunction with the opening of the Moderna Exhibition 2018. The book offers fascinating insights into current artistic expressions from a nation in the process of change. For two years, the curator Joa Ljungberg and the artist Santiago Mostyn conducted comprehensive research into the Swedish art scene. This publication, a collaboration between Iaspis and Moderna Museet, presents their research process, while also highlighting a multitude of voices from the seminars that gathered art professionals from around the country. The publication includes presentations of a total of 65 artists and articles written by 13 authors, all with different insights into the Swedish art scene. Meriç Algün, Muhammad Ali, Emanuel Almborg, Petra Bauer, Ragna Bley, Alfred Boman, Kalle Brolin, Fanny Carinasdotter/Anja Örn/Tomas Örn, Loulou Cherinet, Kah Bee Chow, Jonas Dahlberg, Rebecca Digby, Sven X-et Erixson, Flyktinglandet, Malin Franzén, Mark Frygell, Gideonsson/Londré, Goldin+Senneby, Erik Mikael Gudrunsson, Kerstin Hamilton, Sandi Hilal, Sam Hultin, Thomas Hämén, Ingela Ihrman, Sara Jordenö, Amber Horning, Hanni Kamaly, Kultivator, Runo Lagomarsino, Lap-See Lam, Mårten Lange, Klara Lidén, Helena Lund Ek, Lundahl & Seitl, Anna Lundh, Dinis Machado, Éva Mag, Eric Magassa, Tor-Finn Malum Fitje, Britta Marakatt-Labba, Sandra Mujinga, Åsa Norberg & Jennie Sundén, Nanna Nordström, Ida Persson, Bjarni Þór Pétursson, Olivia Plender, Anna-Karin Rasmusson, Lina Selander, Erik Sjödin, John Skoog, Anders Sunna, Lisa Tan, Cara Tolmie, Anna Uddenberg, Sophie Vukovic´, Knutte Wester, John Willgren, Carla Zaccagnini, Christine Ödlund. Sara Edström/Therese Engström/Anja Örn, Carola Grahn/Ellen Nyman/Corina Oprea, Albin Hillervik, Anna Linder, Jan-Erik Lundström, Magdalena Malm, Temi Odumosu, Katarina Pirak Sikku, Johan Pousette, Lisa Rosendahl, Frida Sandström, Helena Selder, Cecilia Åsberg.